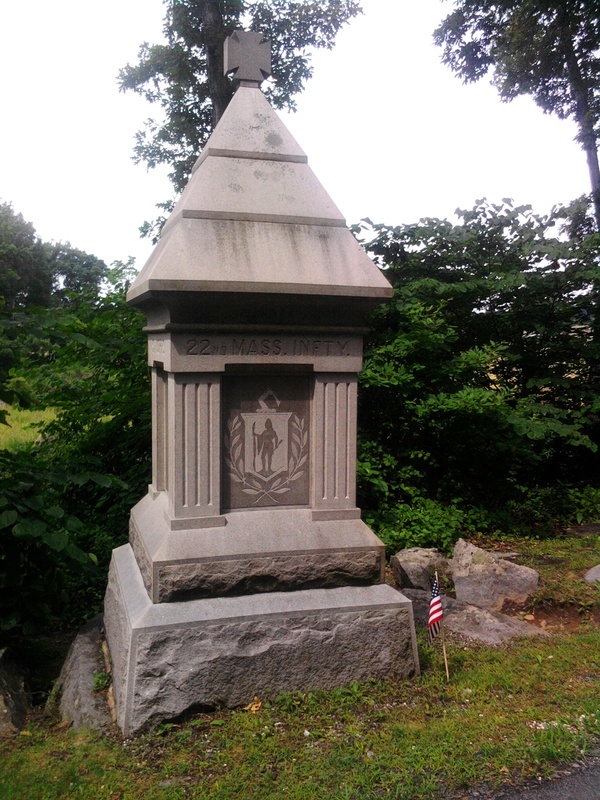 The monument to the 22nd Massachusetts, placed in 1886, is located on Sickles Avenue. During the Battle of Gettysburg, the 22nd Massachusetts was part of the First Brigade (Tilton), First Division (Barnes) of the V Corps (Sykes). The manner in which the 22nd Massachusetts formed was unusual among Bay State regiments. It was organized and admitted to Federal service as something of a special favor to Senator Henry Wilson, the fiery, abolitionist junior senator from Massachusetts. He had, from a distance as a civilian, observed the terrible defeat during First Bull Run and was moved to ask President Lincoln if he could return to Massachusetts to recruit his own brigade. Permission was given and Wilson’s troops would be admitted above and beyond Massachusetts’s quota (something usually prohibited). The brigade did not pan out. But Wilson did manage to recruit a regiment in August and September 1861. The men were mostly from Boston but also included companies from Woburn, Taunton, Cambridge and Haverhill. The 22nd Massachusetts departed Boston on October 8, 1861. They were eventually assigned to the Army of the Potomac and saw their first combat during the Peninsular Campaign. The regiment was overrun and very badly cut up during the Battle of Gaines Mill on June 27, 1862, an engagement which the veterans would long remember as a terrible and sad day. They were not heavily engaged during the Second Battle of Bull Run and were held in reserve with the rest of the V Corps during the Battle of Antietam. At Fredericksburg, they were among the many regiments that made a futile charge against the impregnable Confederate line at the stone wall and took heavy casualties. During Chancellorsville they again were in reserve with the V Corps and saw little action. By June 1863, when the 22nd Massachusetts marched northward along with the Army of the Potomac in pursuit of Lee’s invading army, the regiment had been severely whittled down due to casualties and disease. At Gettysburg they took just 137 men into action, making it the smallest Massachusetts infantry regiment on the field during the battle. The regiment was commanded at the time by Lt. Col. Thomas Sherwin. Twenty-three years old, a graduate of Harvard, he had been employed as a school teacher in Dedham, Massachusetts before the war. He enlisted with the regiment as a lieutenant, quickly became adjutant and rose to lieutenant colonel on October 17, 1862. He had assumed command of the regiment just after Chancellorsville, only two months prior, when Col. William S. Tilton was promoted to brigade command. The 22nd Massachusetts would therefore fight at Gettysburg under a brigadier and regimental commander who were new to their positions. When the Battle of Gettysburg began on July 1, 1863, the V Corps was still about 20 miles away in Maryland. The 22nd Massachusetts had camped the previous evening at Union Mills, Maryland near the Pennsylvania border. At 1 a.m. on July 1, they were roused and made a hard march of 10 miles to Hanover, Pennsylvania which they reached in mid-afternoon. After a short rest, they pressed westward to Gettysburg and marched through most of the night, pausing for a bit of sleep roughly between 2 and 5 a.m. on July 2. They marched the final miles to Gettysburg during the morning of July 2, arriving about noon at Wolf Hill, south of the Hanover Road and well behind the center of the Union line. Here the men collapsed and got a few hours sleep while the generals tried to decide where to deploy the V Corps. When General Daniel Sickles advanced his III Corps to the Peach Orchard and Emmitsburg Road, it soon became apparent that the Union left flank was stretched awfully thin. The V Corps was therefore ordered to the left flank. At about 4:30, with the Confederate assault on the Peach Orchard already underway, the 22nd Massachusetts packed up and marched with their division towards the fight. 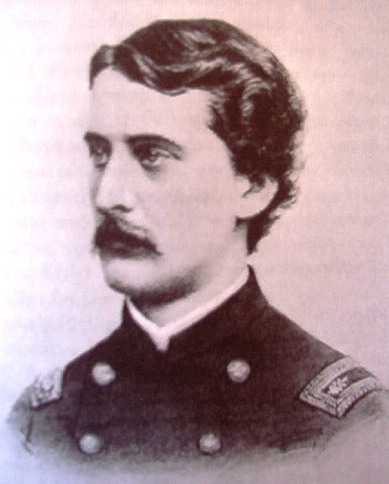 The division was commanded by General James Barnes, another Bay Stater, formerly in command of the 18th Massachusetts, and also new to his role. 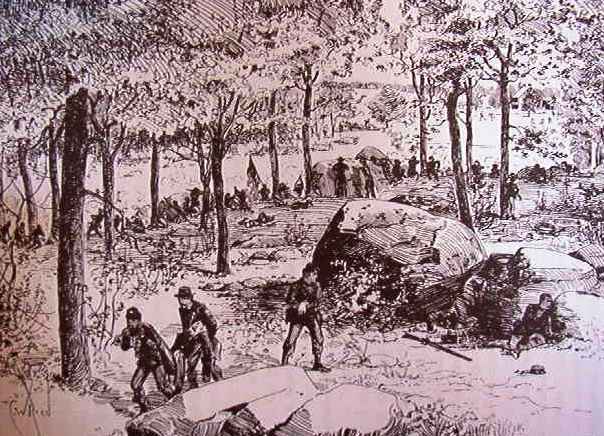 Barnes sent Strong’s brigade (including the 20th Maine) off to the far left to hold Little Round Top while his other two brigades, Tilton’s and Sweitzer’s, marched past the Wheatfield, turned to the left, and took up a position on a wooded knoll strewn with boulders known as Stony Hill. The Rose Farm as viewed from Stony Hill. The men of the 22nd Massachusetts settled in among the trees and rocks, making small piles of cartridges and caps on the ground where they knelt to facilitate loading. It seemed a good spot and they expected to hold it for some time. “We had marched too far and borne too much,” wrote James Parker, the regimental historian, “to be pushed over the ridge behind us.” From that rise, they had a commanding view of Rose’s farm. Immediately before them, the ground sloped downward into a shallow swale. 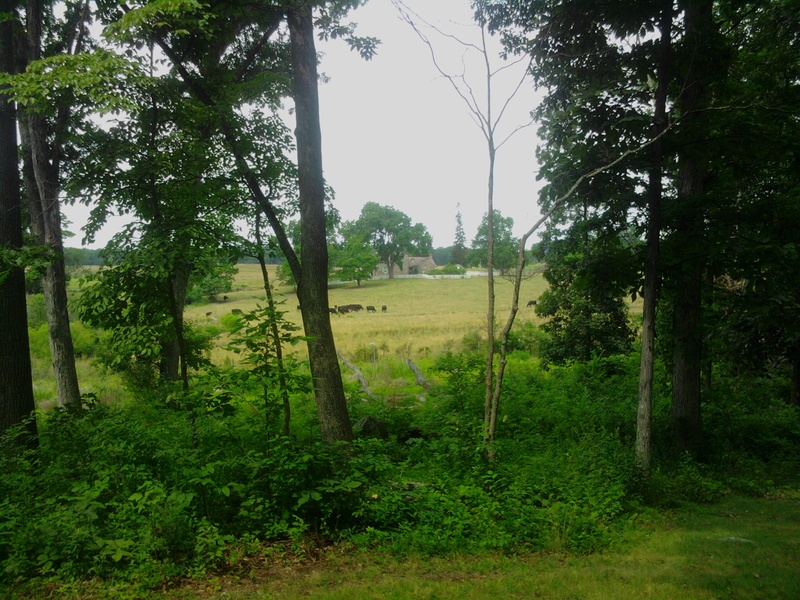 The farmhouse itself stood directly to their front, about 250 yards away. As it would happen, they would not be there for long. As soon as Tilton’s Brigade took their position on Stony Hill, Kershaw’s Brigade of South Carolinians attacked. The 22nd Massachusetts opened fire and their brigade managed to stop the advance. But the South Carolinians regrouped and came on again. “So much din and smoke, yelling and cheering…if any man had sensations of fear before or while going in, he had no time or opportunity for such thoughts now,” Parker later wrote. The South Carolinians pressed the attack and shifted to their left, circling around the exposed right flank of Tilton’s brigade. On that end, the 118th Pennsylvania had refused the flank, bending their line back upon itself. This strengthened their position but also widened the gap in the Federal line through which South Carolinians were now pouring. Watching this evolve, Tilton was becoming unnerved. He sent word back to Barnes that he was being flanked. An order came back from Barnes, “Fall back in good order if unable to hold the position.” Sweitzer was given the same order. Unfortunately, Barnes had absolutely no permission to make this withdrawal. He had not consulted General Sykes, in command of the V Corps, nor did he alert Colonel de Trobriand (commanding a brigade of the III Corps) whom Barnes had been ordered to support. De Trobriand saw Tilton’s men moving off to the right and rear and rode up to the nearest officer, immediately asking where they were going. The response: “We do not know.” De Trobriand demanded to know who had given the order to withdraw. The response: “We do not know.” Furious, de Trobriand was forced to withdraw his brigade as well. The Federal position on and around Stony Hill fell apart. Tilton, in his official report, states that his regimental commanders, having already repulsed two charges, were loathe to leave the position and even wanted to advance. The latter would have been suicide. But, given their strong position, we can imagine Lt. Col. Sherwin and the 22nd Massachusetts felt they could hold a good deal longer. The 22nd Massachusetts on Stony Hill, from the regimental history. As the men of the 22nd Massachusetts continued firing, the word passed down their line, “We are flanked! Change front!” Somewhat stunned, they rose up, “coolly picked up their cartridges and caps, carried all wounded and even their guns to the rear.” The withdrawal of Barnes’s brigades was not a rout, but was certainly confused. As they fell back towards Trostle’s Woods, the 22nd Massachusetts was, at times, mingled with other regiments. Periodically, they halted to reform, keeping their eyes on their colors. As they withdrew, other brigades streamed forward in an attempt to fill the gap Barnes had just created. They would be pushed back as well. At one point during the withdrawal, Lt. Col. Sherwin fell to his knees, doubled over. Men rushed to his aid and found that a bullet had passed through his uniform, and the shock of it had knocked him down. By the close of the battle, the 22nd Massachusetts had suffered casualties of 15 killed and 25 wounded (or roughly 30%). James L. Bowen, Massachusetts in the War, (1888), p. 346-347. Carl Smith, Gettysburg 1863: High Tide of the Confederacy, (2012), p. 29. Unit strength during battles can be a confusing matter. In some cases, after action reports gave the number on the rolls but not necessarily the number of effectives actually taken into battle. With regard to the 22nd Massachusetts there are particularly wide discrepancies as to unit strength. Smith’s number falls about in the middle and is therefore used here. Historical Catalog of the Dedham High School Teachers and Students, 1851-1889, (1889), p. 20. Bradley M. Gottfried, Brigades of Gettysburg, (2002), p. 238. John L. Parker, Henry Wilson’s Regiment, (1887), p. 333-334. Stephen W. Sears, Gettysburg, (2003), p. 286.